Carradice, the very word oozes 'canvas and leather strapping'. No where in my opinion can you buy better cycling luggage and saddlebags than from Carradice. I am rather new to cycling, so when recommended this firm by other members of the CTC forum back in 2008, I took a look. 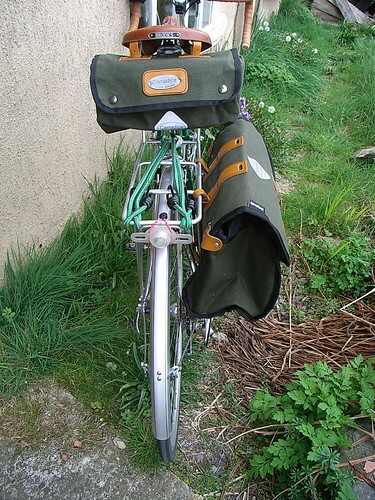 When I was planning my first cycle tour along "Hadrian's Wall', I purchased a pair of Carradry rear panniers for my daughters bike, and I purchased a Super C bicycle top rack for myself having already purchased bags for my tourer elsewhere, sadly before I had been given recommendations about Carradice of Nelson. This post is written in appreciation of a fabulous product. I have used my Super C rackbag every single day since its purchase. It has been used in monsoon conditions – as only the Isle of Man can chuck at you, as you pedal in earnest to work each day, against gale force winds, driving rain and enduring that extra deluge bestowed upon your person by traffic as it passes you. It is a fabulous bag, and each winter day it carries my waterproofs if I am not wearing them at is, and all my puncture equipment for those pesky moments when 'she who should not be named' lances your steed just cos she can. The Super C rackbag is essential for me, as I carry my work clothes fresh each day. It is big enough to pack a pair of trousers, a top and a light weight jumper as well as a pint of milk and a jar of marmalade for the week ahead. Plus keys, mobile and my purse. Never once since its purchase has it ever leaked water into it, no matter what Mrs Nature threw at us each day. But, after a year, to be sure, I waxed the bag. This is a very easy procedure. I used the same wax you buy in a tin that does a Barbour jacket. Open the tin – insides look a lot like set paraffin wax. The tin is then gently heated until melted and clear in a saucepan of hot water. Using a clean paint brush I dabbed the entire bag with the wet wax which penetrated instantly. Once covered, I used a hair dryer to really soak it into the cotton duck fabric, the hair dryer was used until I could no longer see dampness on the cotton duck fabric. Now another year on, still no water has ever got into the contents which is important to a commuter who rides to work in all weathers other than snow. Then a minor wear and tear. After having lugged this bag for over 7,500miles the Velcro that attaches it to my cycle rack started to lose its grip. I shall add, that the bag is attached and unattached twice a day 5 days a week. Even the hardiest of Velcro will become fluffy instead of grippy after that kind of treatment. The bag was duly packed back to Carradice for a minor repair. I did this over Christmas as I wasn't in work during the school holidays and in nippy quick time the back was back. Cost – well, the repair including postage was £8! Some of you know him already, he is my devoted bestest kitty pal. Albert appeared in our lives about 7 or 8 years ago. Where we used to live in Sulby, he used to terrorise our own house cats, many a time I have dragged our injured felines yowling in despair to the local vet for antibiotic jabs and stitches. 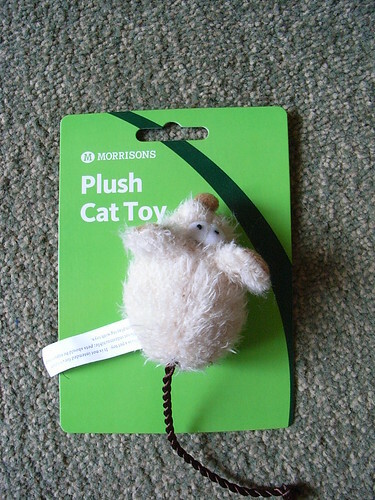 Our cats all had the black eyes, pulled fur, ragged ears. All we ever saw of this elusive horror was his bum as he fled having left behind yet another casualty. One day, he did not run away. He waited at the end of our walled garden just sitting – looking and waiting. He was very thin and full of worms and fleas bounced off his body. He needed a retirement from being a local thug and the 'mouse running underworld' had lead him to our cosy cottage with fat cats lounging in the morning sunshine. 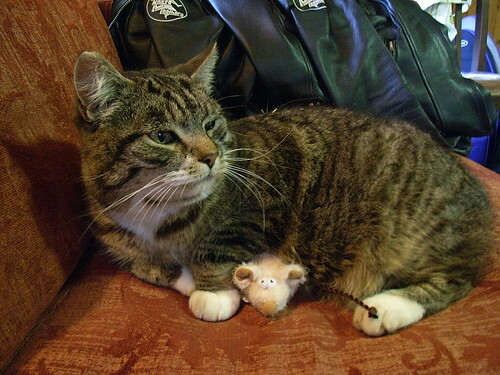 My youngest daughter was about 12 at the time, and she felt sorry for this ragged old looking tom cat. She sneaked him some kitty biscuits... and well, thats all history now. Albert had to lose his crown jewels to live with us, but he didn't seem to mind. Maybe the life of cuddles when ever you needed them by a blazing log fire, on a cosy knee with as many willing thumbs to prize open cans of delightful kitty nosh with no bones, tails or fur to dispose of.... was a good exchange? Who knows. 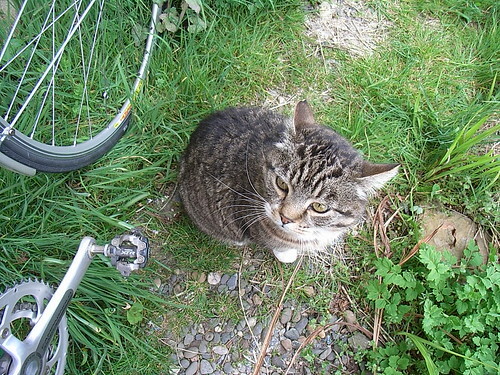 Certainly this wild and terrorising Manx cat became tame and gentlemany (after some time I shall add). Never has he turned on one of us. Though he is of course King of the cats in our cottage. Anyway, Albert being Albert and always game posed for this picture: As it happened, while scanning the site of Carradice of Nelson I looked at the gallery and submitted the following picture to the company. Now, isn't this proper service folks, with real meaning and love? I was so chuffed that Albert had touched someone from afar with his tales (or no tail, as to be honest as he doesn't have one!). I bet few other companies cycle ones or otherwise have such an aftercare (cat) service as Carradice does. In April, after a year long wait, my new road bike was ready for collection. This cycle is going to take me from Lands End to John O Groats in aid of Age (Isle of Man) next summer. So who's cycle bags did I buy to compliment this cycle? Not just because of Albert, I shall add, but due to commitment to a truly wonderful aftercare service in an age of 'chuck away and buy new' era. The workmanship of this British Fair Trade company would not have me going anywhere else for cycle luggage. AND they happen to produce their canvas in a nice green colour too. My new bike happens to be emerald green. To compliment the paintwork I chose Brooks bar tape and a Brooks Finesse saddle in honey, so the green saddle bags compliment the bicycle perfectly with their honey leather strapping. They look fabulous on my traditional looking bicycle. Here is the cycle modelling both the saddle bags. The bigger bag is the Cadet bag. This has the same volume as the Super C rackbag, I would of bought another of these had there been a green option, but I am very pleased with the Cadet bag. And yes, I am brave am I not, just getting one! I chose the smallest saddle bag, which although only has a 2 litre capacity, has enough space for my jacket and pump, plus purse, mobile and I can cram in a bit of food on an Audax run too. There are now two Audax Perms on the Isle of Man, and with a neat small bag, I can carry everything I need. The new bike has already completed its first Manx Audax ride and shaved an hour off my personal best time. Its very light and responsive, and the drop bars are far more comfortable than I thought they would be. I am looking forward to its next Audax in May, followed by the Audax in Caton in June. Posted by Mary on April 23rd, 2010. Your Post reminds me of some of my favourite possessions: a leather covered Rabone Chesterman measuring tape and a Parker Duofold fountain pen, both of which I used a lot before the digital age but don't use now. 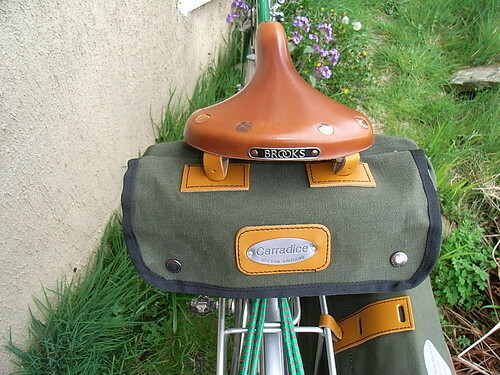 It's nice to see a British firm still making 'traditional' products like Carradice Original Saddlebags of the type you used to see at school. I wonder how many bike bag manufacturers still make bags that use the special clips on Brooks Saddles? They look great together. 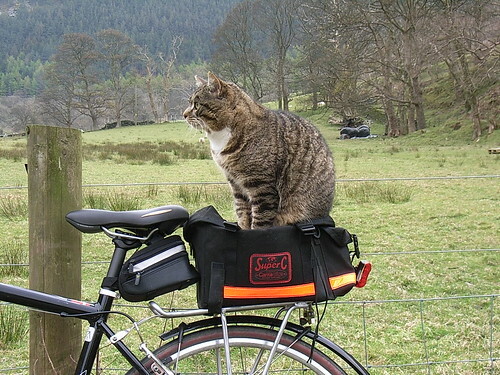 I've often fancied taking our cat out for a spin on the bike rack but she's much too timid even to leave the house. Nice kit, Mary. I'm afraid my Carradice equipment is about to be put into semi-retirement. 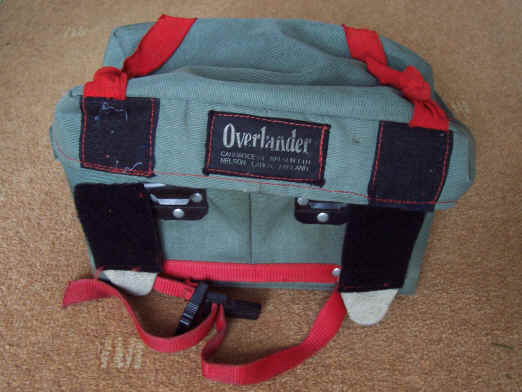 I can't fit this old fellah properly on my new bike so I'm thinking of going for an Altura Orkney bar bag. Our touring panniers are Altura Orkney. It's what was in the shop. They're good but modern styled, and I doubt if they're made in the UK. With the top mounted brake levers I don't think there's room for a bar bag. 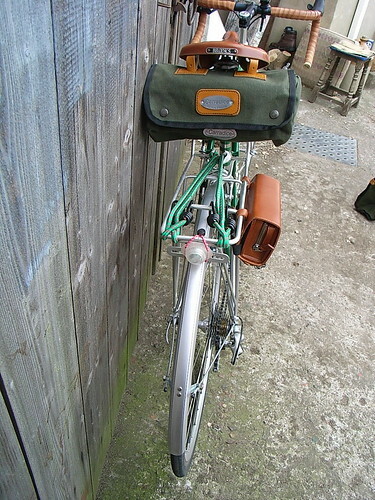 Since my 80s Carradice Overlander gear all of my panniers and rack bags are Altura. So I fancy a matching bar bag in same brand. There's some information I read earlier about the Ridgeback Panorama and Altura handlebar bags here. I've had a Super-C Racktop bag for several years, I've never waxed it and it's never leaked. I also have a Carradice Nelson Longflap which looks pretty shook and is 14 years old and a Super-C Saddlebag (don't like the pocket closing system, it's a bit iffy), and a small Junior Saddlebag. I've not had their panniers as I've a 15 year old pair of Red Ortlieb panniers which are battered but unbowed. These are two very good makes. My first panniers were an Irish make, Sporthouse and they had several obstreperous features, but in general, pannier design has improved a lot since then. Hi, great article on Carradice – I'm a long-term fan. I have a question for correspondent Chris if he's still reading. I have an ancient black cotton Carradice handlebar bag like no other Carradice product I've seen. It's black cotton duck with a lid opening from the rear (opening facing the rider) and sown at the front. In fact the lid only partially opens with the 'hinge' seam extending part-way along the sides so the lid sort of 'flexes' – I suppose to ensure extra water proofing. The thing I notice is that it has exactly the same unusual plastic hooks as your Overlander bag, Carradice cannot tell me how these hooks were used – what they hooked in to! I presume that some sort of rack is involved. Any chance you could describe it to me or perhaps send me a photo? Is your Overlander for sale? My email is kabir(at)chariot.net.au (I'm in Australia). Get back to me if you would like better photographs. It may take a day or two, but I really don't mind if you would like to have a frame made to a model or something.